I admit it. I’m one of those people who love walking by homes at dusk so that I can peek into the windows and see the decor inside! I love walking through model homes so that I can glean decor ideas, and I especially love browsing luxury home listings for inspiration and entertainment. If you are anything like me, then this post is dedicated to you—fellow lookie loos unite! Today I’m going to give you a sneak peek into some fabulous celebrity homes courtesy of Homes.com. To make things a bit more fun, Homes.com has given me $100 Target gift card to give away to one of you. Woohoo! We get to be inspired by celebrity homes and then use that inspiration to spruce up our own spaces. Let’s get to it! 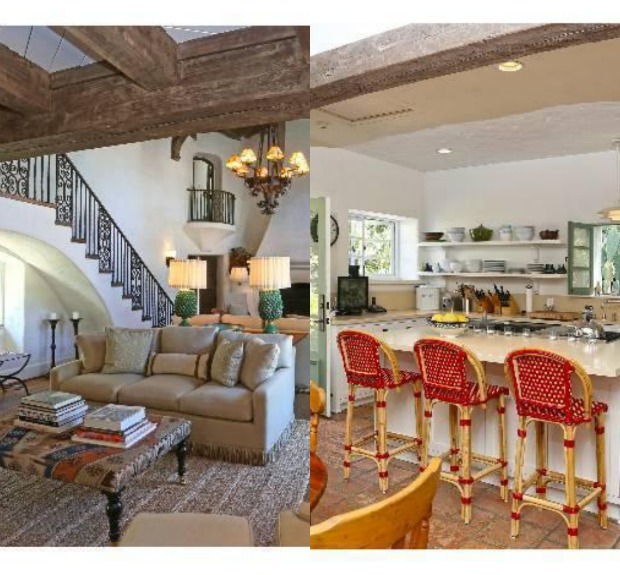 I adore this listing for Drew Barrymore’s California home. The kitchen’s yellow checkerboard floor, yellow bar, and blue fridge seem very Drew don’t they? And I smiled to see we share the same Anthropologie duvet in our bedrooms. Of course mine is currently in my master bedroom and hers is probably never used in one of her 5 guest rooms. Listing pictures from Reese Witherspoon’s Ojai Ranch are impressive! I am in love with those rustic beams. And just look at the views from Matt Damon’s lovely Miami Beach listing! In addition to the VIP Living category on the Homes.com blog, you can simply browse the listings of pricey geographic areas. I highly recommend perusing the 90210 zipcode for current listings. There are some great pinnable images to be found! So know that we’re inspired, let’s get to the giveaway details! All you need to do to enter is follow the directions in the Rafflecopter widget below. (Give it a minute to appear if it’s not showing. It sometimes takes a minute to load.) Good luck and happy browsing and dreaming! I love Robin Williams house pool and the kitchen. They are all amazing but I think I’d pick Drew Barrymore’s just for the kitchen! I LOVE Robin Williams’ California home. So pretty (and big)! the Beverly grove house in Beverly hills (under jimmy fallon’s move) is so airy and open! Love Drew’s house, surprisingly cute! Thought it would be a little funky but it’s not. 😉 Love Target! Thanks for the giveaway! Love the colors and warmth of Drew Barrymore’s home. 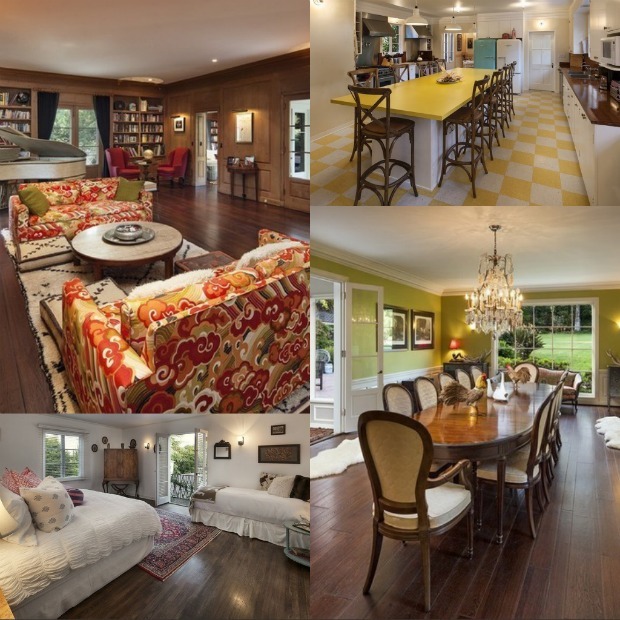 I love Drew Barrymore’s home – classy and funky! I think Robin William’s home is beautiful! So happy I found this site. I love looking at beautiful homes! I love looking at ideas for ways to do things in my house! So pretty, I love Drew Barrymore’s home! Reese Witherspoon’s for sure! Love her and her style! I adore Mark Wahlberg’s house. If I bought it, do you think he would come with it? I like Drew Barrimore’s California home! I couldn’t pick a favorite, but they make me want to move. Of all the things I love, seeing how other people live and decorate their homes ranks up high for me. I love homes that are rustic and comfortable. Ones that stand out to me: LeAnn Rimes newly purchased home, Olivia Newton Johns home, Drew Barrymore’s home, Reese Witherspoon’s ranch, Sally Field’s homea, and Brad Garretts home he recently listed. I have always enjoyed home tours…I especially like the ones in the historic homes in my area. And, I would truly love to tour inside these celeb homes…the photos are the next best thing. My favorites are Drew Barrymore’s (it invites you in to relax) and I also love Reese’s home. Thanks for this giveaway opportunity!! I’m a fellow lookie loo too! I love walking through model homes for inspiration and decor ideas 🙂 thanks for the giveaway! I agree, I love looking in people’s homes! And Drew Barrymore’s kitchen is so dreamy! Of course, yellow is my favorite color! I LOVE pretty much everything about Drew’s house!! Beautiful and cozy! I love those rustic beams in Phil Mickelson’s house! I love Robin Williams’ home! Wow! Very impressive. Thanks for the giveaway. They are all so cute and luxurious but Witherspoon’s house takes it for me. Reese’s house is pretty cool! It’s fun looking at all the homes and difficult to choose a favorite. I love Jon Bon Jovi’s New york home! I like Jon Bon Jovi’s New York home. I like Jon Bon Jovi’s New York Home – wow! I like the superhero listings post. I love Robin Williams home the theater room and infinity pool is awesome. Matt Damon’s decor is beautiful! reese’s house in ojai – amazing!! so relaxing and cool! i’m loving reese witherspoons ranch! I like Goldie Hawn and Kurt Russel home in Malibu. Relatively inexpensive $14.75 million, I love the oceanfront patio and the covered outdoor living room that has a fireplace. And a designer kitchen! What’s not to like! Mark Wahlberg house with the movie theater and pool. It’s like a vacation in itself. Well, I “guess” I could make do with Matt Damon’s house if I had to………….Simply gorgeous! Love all the water. Frank Capra has a gorgeous view overlooking the pool. I like Drew Barrymore’s listing! Oh I loved Reese Witherspoon’s California Home! I’d go with drew Barrymore love her style! Matt Damon’s home is beautiful! I love Jimmy Fallon’s home! It’s so relaxing! browsing the pricey homes online is a favorite thing to do for sure. Fun to dream! I love Heidi and seals outdoor patio! Many thanks for the chance to win!!! Love seeing these great homes. I love Jimmy Fallon’s, especially the ceiling in the dining room. Swoon. can’t wait to browse online listing in great zip codes!!! Love Drew Barrymore’s listing. Looks comfortable! Thumbs up for Reece’s home. I love Matt Damon’s listing. Soon I’ll be listing my home…too bad our pix won’t look as impressive. These are almost a tease to look at! Thanks for the inspiration! I love Reese’s home! gorgeous! OH my goodness! Mark Wahlberg’s place is just insane! I wouldn’t mind having a private pool/lake in my back yard. Drew (or her decorator) has a fun use of color. A lot of bright spring hues, which I’d love to fit into my place. Very fun! I love Drew Barrymore’s kitchen. I love the rustic beams. Lounging by that pool at Matt damons house wouldn’t be bad either. I love Mark Wahlbergs home. The pool and basketball court are amazing! Very interesting! And who doesn’t love Tar-jay!? Thanks! I love the modern vibe at Matt Damon’s place! I really like Robin Williams’ & Drew Barrymore’s homes. Sacha Baron Cohen and Isla Fisher’s house is beautiful. It’s not overly big or flashy, and I love the subdued color palate. I could totally live in Drew Barrymore’s house! Very charming. I like Jimmy Fallon’s house. I love Reese Witherspoons home! Gorg! those beams are beautiful!! i love mark wahlbergs house! but that could be bc i love mark wahlberg…. Mark Wahlberg’s pool is to die for and the view is amazing. Matt Damon’s Miami Beach Home! Another vote for Drew’s house. Love the dark wood floors in the bedroom and the yellow in the kitchen. So enjoyable to look at ! I really liked Sacha Baron Cohen’s house! I love Mark Whalberg’s home for the amenities! That pool is amazing! So many great homes. So much inspiration!! I love looking at celebrity homes too! They have every little accessory in the right spot. I really enjoy your website. I have it bookmarked on my computer. I’m so relieved to know that I’m not the ONLY one who likes to drive through the more elite neighborhoods in town just to peek through the windows!! LOL! Thanks for such a GREAT giveaway! I am in LOVE with Drew’s home! I am a night time window peeler too! Love Drew’s house thanks for sharing & for chance at gift card!! I am in love with Reese Witherspoons house! So relaxing and beautiful! Thanks for the opportunity! ! Thanks for giving us a sneak peak into those beautiful homes. They are all stunning, but I have to say Drew’s is my favorite. It has a real “homey” feel to it. I like Reese Witherspoon’s house! I like Matt Damon’s home. Thanks for the chance! Drew Barrymore’s house looks beautiful! Reese Whitherspoon’s house is so pretty! I love looking at homes too! I love those wildly patterned couches in Drew Barrymore’s house. They are great with the wall color in the dining room. Jon Bon Jovi’s New York home is amazing! I like Matt Damon’s pretty Florida home! Robin Williams home…..and I am a bit shocked by that….I never would have expected that! I loved the outdoor living space of the home in Los Angeles, California. The entire home is gorgeous, but I love the outdoor courtyard. The ivy or greenery covering the entire wall of the home is beautiful! LOVE looking/”snooping” through celebrity homes – did you see Mark Wahlberg’s house?? Craziness I tell ya! That pool is ridiculous!! I like Jimmy Fallon’s but they’re all jaw-dropping! Thanks! I really liked Sacha Baron Cohen’s home. ooh, I have that duvet too – love it! Love Matt’s place except for the kitchen. Love the inspiration here…thanks for the give-away opportunity. Robin Williams’ house is my favorite. I really like the “for the NBA” homes. They are so cool! I like Drew Barrymores home – just gorgeous! I loved them all, but I think I like Robin Willams’ the best!!! Beautiful! Phil Mickelson’s home – please?!? I like the view in Alicia Key’s home (and those floors!). I love Robin Williams house because of the breathtaking views! The Reese Witherspoon home is gorgeous. I love the yellows and browns in the kitchen. Lovely! I love jon bon jovi’s penthouse. the views are spectacular. I love the large terrace. I still love Drew Barrymore’s house. Seems so “livable”! Robin Williams’ house is fantastic! I can totally see myself living there! Oooo, I love all of them. But, the 3rd home picked out for Jimmy Fallon is awesome!!! So beautiful! All of them! And I am so the same way. I love the views from Matt Damons but Drew Barrymores is my favorite. I love everything about it. I love her love of color! I like Drew Barrymore’s home. Robin Williams’ home is stunning! I love the outdoor areas and the movie theater…how awesome would that be. Gosh, that was fun! Nice to peek in on how and where the celebs live. I have to say Drew’s is as cute and colorful as she is. Love that it really seems like a real reflection of her as a person – what home’s all about. I absolutely ADORE the rustic beams in Reese Witherspoon’s home but the library/sitting room in Drew’s is pretty amazing as well! I love Reese Witherspoon’s ranch. I love Drew Barrymore’s house!! I too love to look at peoples homes and see how they are arranged and decorated. So many of them are gorgeous! I have to agree that drew barrymores house is very “drew”, and I love all the whimsy! Thanks for the giveaway! Love looking at others homes and getting ideas. Robin Williams’ home for the pool and the views! And the theater! Love, love, love, Reese Witherspoon’s house! So beautiful! I would take any of these houses but I really love Matt Damon’s!!! Celebrity homes for sale is one of my favorite articles in People. This is so much better! Robin Williams’ home – omg! The view is stunning. Not to mention the rest of the house… But as one of my high school teachers always used to say, “It all comes down to ‘Location, Location, Location. '” Wow! I think Drew Barrymores home that she has listed is my favorite. It is beautiful.